David Hart, Public Defender, will deliver a talk called “Bar none: The challenges black lawyers face when representing black clients in the criminal justice system” on Thursday, October 6, at 3:30 p.m. in University Center room 275A. It’s part of the African American Heritage Lecture Series. Would you like to learn more? 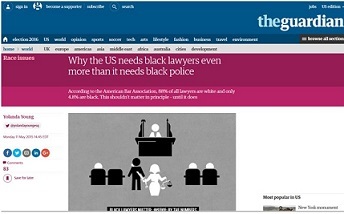 Andersen Library may be able to help with finding such articles as “Way to represent: The role of black lawyers in contemporary American democracy” (Fordham Law Review, 2009, vol.77:no.4, pp.1409-1434), “‘I want a black lawyer to represent me’: Addressing a black defendant’s concerns with being assigned a white court-appointed lawyer” (Law and Inequality), 2002, vol.20, pp.1-52), “Who is my client? Client-centered lawyering with multiple clients” (Clinical Law Review, 2015, vol.22:no.1, pp.145-180), “Race and the attorney-client relationship” (Journal of the Kansas Bar Association, 2011, vol.80, p.9 — search in WestlawNext’s secondary sources, law reviews and journals, for the article title in quotation marks), “Race, identity, and professional responsibility: Why legal services organizations need African American staff attorneys” (Cornell Journal of Law & Public Policy, 2008, vol.18, p.1), “Race and representation: A study of legal aid attorneys and their perceptions of the significance of race” (The Buffalo Public Interest Law Journal, 1999/2000, vol.18, p.1- ), and on the web site of The Guardian newspaper is “Why the US needs black lawyers more than it needs black police” dated May 11, 2015. This entry was posted in campus connection and tagged articles, attorneys, diversity, justice, law, lawyers, lectures, race, speakers. Bookmark the permalink.